BENGALURU/SINGAPORE (March 1): Asian currencies fell on Wednesday, after comments from U.S. Federal Reserve officials bolstered expectations for a Fed rate hike this month, even as President Donald Trump's speech lacked details on his plans for tax reforms. The Singapore dollar fell 0.4% to 1.4090 to the U.S. dollar, pulling away from a three-month high of 1.3975 set on Tuesday. The Philippine peso slipped 0.2% to 50.305, getting close to a 10-year low of 50.355 touched on Feb 21. The peso has underperformed other Asian currencies and is the only one to weaken against the dollar this year. One factor pressuring the peso has been a recent widening of the Philippines' trade deficit, analysts say. On Wednesday, Asian currencies fell across the board as the dollar gained a lift, after a handful of Fed policymakers jolted markets into higher expectations for a U.S. rate hike in March. The latest comments from Fed policymakers seemed to overshadow Trump's speech to Congress, said Sim Moh Siong, FX strategist for Bank of Singapore. While Trump's speech was light on details, it was not much of a disappointment, Sim said. "It's only a disappointment for people who were looking for details, but I don't think the market had high expectations to start off with," he added. In the long-awaited speech to Congress, Trump said he was open to immigration reform and touched upon his plans to boost the U.S. economy through steps such as tax reform and a US$1 trillion infrastructure effort. Trump said he wanted to provide "massive tax relief" to the middle class and cut corporate tax rates, but did not offer specifics. 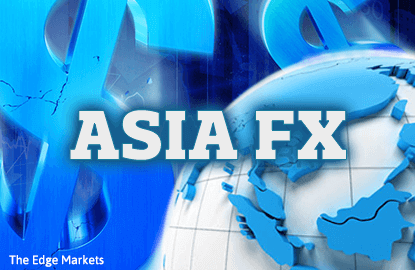 The dollar should advance against emerging Asian currencies to some extent, prior to the Fed's policy meeting on March 14-15, said Gao Qi, FX strategist for Scotiabank in Singapore.